Are You Serving Alcohol Lawfully? TAM® Cards Expire After 4 Years – TAM Card® Nation in Vegas! Over 200,000 hospitality and service workers are employed in Clark County, most of whom are required, by state law, to receive alcohol awareness training and carry an Alcohol Education Card. Alcohol awareness training is mandatory for those who serve or sell alcoholic beverages or provide security services in casinos, restaurants, bars, clubs, and grocery/convenience stores in Clark and Washoe Counties. Many establishments also require anyone who handles alcoholic beverages and their managers and executive staff to carry cards. Do you already have your alcohol card? Great, but make sure to check the expiration date! TAM® Cards expire after four years, so don’t delay in staying current with your education. There is a common misconception that one can “renew” their card by paying a fee or taking a short quiz, but law dictates one must re-take an approved alcohol awareness course every four years. Laws, policies and procedures, and even available alcohol products can go through considerable changes in four years, and it is very important for service professionals to be aware of those changes. The benefits of refreshing your education include staying up to date on current laws, refreshing knowledge about how alcohol affects the body and learning about what to watch out for, how to react to certain situations, and more. 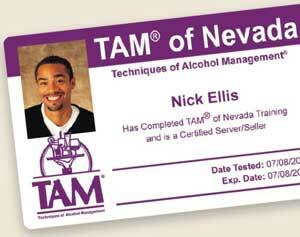 Providers of alcohol awareness training, such as TAM® of Nevada, must be approved through Nevada’s Commission on Postsecondary Education. Cards issued by providers and provider locations not on the approved provider list could be deemed invalid. Training can be taken online or in the classroom. If you’re interested in completing your training online, you can view our online course demo and sign up for a class here. All students must physically go to the provider’s approved school location to take an exam that is proctored and pass the proctored exam with a score of at least 75%. TAM® of Nevada has convenient proctoring hours six days a week for students to drop-in to take their exam and obtain a TAM® Card. Next Summer Jobs – Opportunities Abound to Work Poolside in Las Vegas!